Delta Products Group based in Aurora, Illinois handles worldwide distribution of its descaling products to businesses throughout North America, Australia, Asia and Europe. With a history of developing and refining a complete line of unique industrial descaling and cleaning products, Delta Products is your single source solutions provider. Delta Products is committed to getting you positive results. We listen to your situation and advise the best process to clean and descale your equipment or system. We custom tailor a cleaning solution for you based on research and experience, taking downtime and cost into consideration. Delta’s descalers are biodegradable, non-toxic, non-corrosive, and non-flammable. Safe enough to hold in your open hand, our products can be flushed down a regular sewer system. We keep your staff safe. We also offer customized pumping solutions to maximize your cleaning capabilities. USDA Rating A-3 - DeltaSafe D Scale, Safe D Scale PLUS and 888 DESCALE are cleaning compounds used in industrial food and manufacturing plants and have a USDA rating of A-3 with no toxic compounds. Delta Products Group Is Dedicated To Creating the Technology To Provide Exceptional Results. For more than 70 years history, Delta Products Group has engineered biodegradable descalers as well as supporting products, pumps and equipment to make cleaning commercial equipment easier and more manageable. Harnessing the power of science, technology and a wealth of experience, Delta Products Group works with maintenance management and engineering managers to enable solutions for maintenance plans, preventative maintenance, emergency cleanup, shutdown and turnarounds. 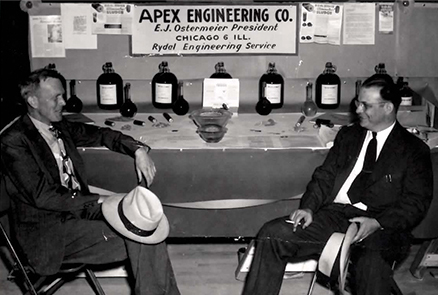 Apex and Delta Engineering were founded in 1938 by Edwin Ostermeier and carried on by his son, Don Ostermeier. The first manufacturing plant established in 1962 allowed the company to focus on innovation and business growth. Company expansion included DuPage Kinetic Labs, serving the medical community and then Apex Engineering Products, serving non-medical industries. By 1969, the third generation of Ostermeiers were managing the plant and handling very large cleaning projects. After a large plant expansion and some restructuring, the Ostermeier brothers separated. Eric moved on to manage Apex Engineering while Mark Ostermeier founded and continues to manage Delta Products Group, Inc.
Delta Products Group, Inc. founded in 1996, pioneered the development of revolutionary new cleaners that increased the product line from 3 to 25 and became the first and only descaler allowed onboard U.S. Navy’s nuclear submarines. With the expansion to include overseas packaging, branding and distribution centers in 2003, Delta’s growth continued to soar. In 2014, Delta Products expanded their workspace and workforce to continue to serve a wider market of clients looking for descaling products. Delta Products Group, Inc. believes in providing customers solutions that work for their challenging problems in the most efficient and productive way possible. Delta prides themselves on the principles of sustainability and works to create self-sufficiency with their products and services. Mark Ostermeier, founder and president of Delta Products Group, Inc. was raised in the family chemical business. Before he graduated high school, Mark was managing off-site descaling projects and working weekends and summers in the plant. After his studies of mechanical engineering at Bradley University, Mark joined the family business with a forward thinking mindset to drive the company forward. Mark takes an active management role and oversees research and development and pioneering new descaling technologies. He manages business development and operations, expanding Delta Products Group’s reach to new markets. He has a keen eye to constantly improve on a process and strives daily to make work easier and more fluid. Delta Products Group has representatives throughout the United States and clients around the world. We can put you in touch with a representative in your area or we can handle all your questions from our main office. If you are interested in using our products, give our office a call and we will connect you with a knowledgeable sales representative to assist you. Delta Products Group. All Rights Reserved.